The two most important aspects of carpet care are regular vacuuming and walk off mats. With respect to walk off mats, there are 2 areas to address. Door mats for the entrance and exits from your home and internal mats for those transitions from a hard surface to a carpeted area. Door mats at the entrances to your home are very important for keeping the outside dirt from tracking onto your carpets. They should be placed both at the outside entrance to your home and at the inside entrance. The outside mat’s purpose is to scrap debris off shoes and to hold it. Therefore, they should be made of a more abrasive material. Also, many people do not purposely stop at an outside mat and wipe both feet. Therefore, the mat should be the width of the door and deep enough that both feet land on the mat during walking, approximately 3.5 to 4 feet. The inside mat’s purpose is to remove the smaller particles of dirt as well as oils and other liquids that can be tracked from the outside. 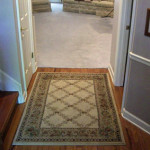 Area rugs can work well for this purpose but make sure there is a non-slip pad underneath. Once again, it should be the width of the door and deep enough that both feet land on the rug during a natural walk. Internal mats are good to slow down wear patterns. They should be placed wherever there is a transition from a hard surface to a carpeted area. Internal matting addresses two concerns. One is the difference in height between a carpeted area and hard surface. Typically the carpet fibers are a little higher than the hard surface and as a result, feet scrape across the fibers creating excessive wear. The other consideration is the loose particles on the hard surface being carried into the carpet fibers. This is especially important if the hard surface is the kitchen. 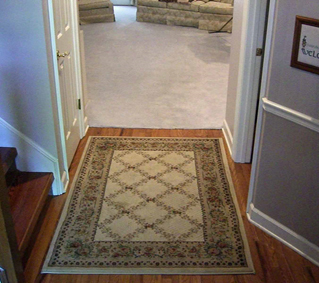 An internal mat, whether on the hard surface or the carpet, can minimize both concerns. While I talk about mats, an attractive area rug can also serve as a mat. While the function of mats within the home is beneficial, they can sometimes create a conflict with the visual presentation and feel you want to achieve. However, outside matting should never be a problem. Remember, anything you can do, with respect to matting, will help prolong the appearance and life of your carpets.